Israel generally has two seasons — summer (Apr-Sep) and winter (Oct-Mar). Cities along the west coast (Haifa, Netanya, Tel Aviv) experience a Mediterranean climate with long, hot summers and mild, rainy winters. 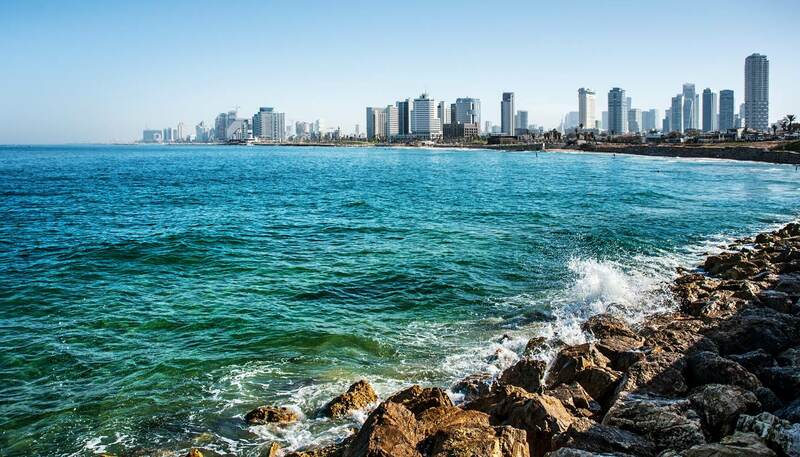 In Tel Aviv, January is usually cool with an average high of 17°C (63°F) and an average low of 8°C (46°F). Also expect 70-110mm (8-12 inches) of rain per month from November to February. July and August are hot and humid; August is usually the hottest month with an average high of 31°C (88°F). 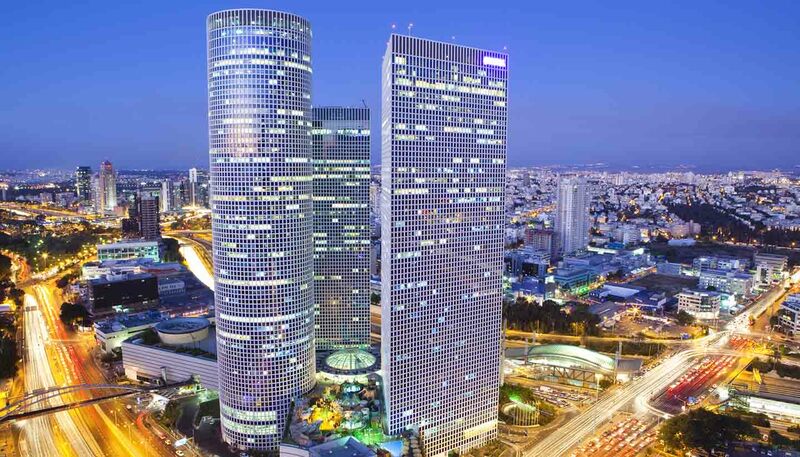 The best time to visit Tel Aviv is from March to May and September to October, as the weather is pleasant and rainfall is at its lowest. The climate gets more arid as you move further inland. Jerusalem, for example, has dry and pleasant summers and cool winters. January is usually the coolest month with average temperatures hovering around 8°C (46°F). January is also the wettest month. Snow is rare though. The period between April to September is pleasant with little rain; this is the best time to visit Jerusalem. 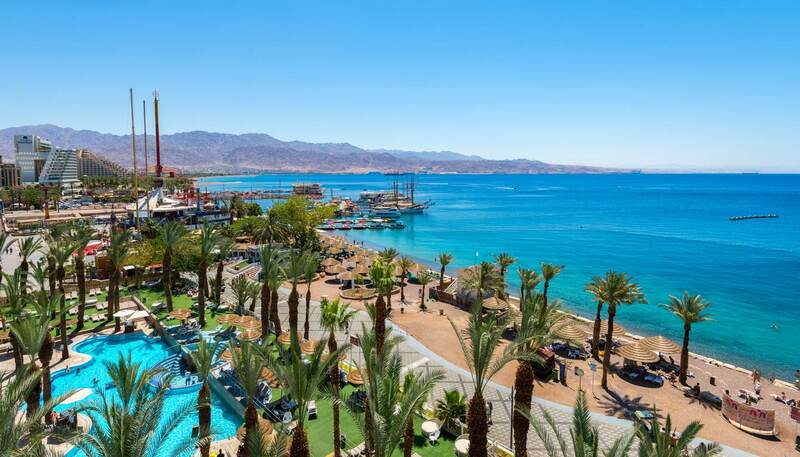 Eilat, Israel's water sport paradise on the Red Sea, has a hot desert climate with extremely little rainfall, making it a year-round holiday destination. Click here for more information on this weather in Eilat and the best time to visit guide. Lightweight clothes for warmer months and also for Eilat. Medium weights are recommended for winters or for nights spent in the desert as the temperature can drop considerably. Israel is on the eastern Mediterranean, bordered by Lebanon and Syria to the north, the Palestine National Authority (West Bank) and Jordan to the east, and Egypt to the south. Gaza, a small coastal strip between Israel and Egypt, is claimed by the Palestine National Authority, but under de facto rule by the militant group Hamas. Although relatively small in size, Israel contains a great variety of terrain and four climate zones. The north of the country is the fertile hill region of Galilee, rising to Mount Hermon and Golan in the northeast. The lush Plain of Sharon runs along the coast, while inland a range of hills and uplands run into the relatively barren and stony areas of the east. Temperatures vary widely throughout the country. The coastal area has long, hot summers and cool, rainy winters. The northern Negev desert has a semi-arid climate while the southern Negev (including Eilat on the Red Sea) has a hot desert climate with extremely little rainfall. The Dead Sea (the lowest point in the world) sits on Israel's eastern border along the great Syrian-African Rift Valley. Israel's largest freshwater lake, the Kinneret (also known the Sea of Galilee), is an important source of drinking water for the country and a significant religious destination for Jewish and Christian pilgrims. Owing to its location on climatic and geographical crossroads, where the northern steppes of Europe meet the Syrian-African Rift Valley, Israel has a surprisingly varied flora and fauna. It has an estimated 2,867 species of flora and approximately 100 species of mammals. The country is also a crucial stop-over on the great bird migrations as they make their way north and south twice a year. The Israel Nature and National Parks Authority is responsible for more than 70 national parks and more than 200 nature reserves in Israel.